55 years after John Glenn departed The Cape atop an Atlas rocket, a spacecraft named in his honor blazed into clear skies over the Space Coast using a much evolved version of the original Atlas booster. The S.S. John Glenn took flight at 15:11 UTC, 11:11 a.m. local time under the loud thunder of the massive RD-180 engine propelling Atlas V away from Florida. The rocket’s first stage fired for a little over four minutes before dropping away and handing powered flight over to the trusted Centaur upper stage which has been in charge of boosting payloads into orbit for more than five decades. Centaur fired for nearly 14 minutes to put the Cygnus spacecraft into a Low Earth Orbit, setting the stage for the spring-loaded separation of the 7,200-Kilogram cargo ship 21 minutes after liftoff. The S.S. John Glenn will be taking the scenic route to the Space Station, gradually raising its orbit over the next three days to stay clear of an incoming Soyuz flight with two ISS crewmen on Thursday. 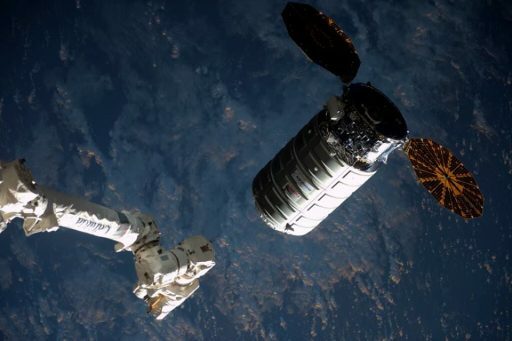 Arriving in the neighborhood of ISS on Saturday, Cygnus will approach the complex from directly below and come to a halt within reach of the Station’s robotic arm for a 10:05 UTC capture, marking the start of an 80-day stay facilitating the transfer of nearly 3,500 Kilograms of cargo. 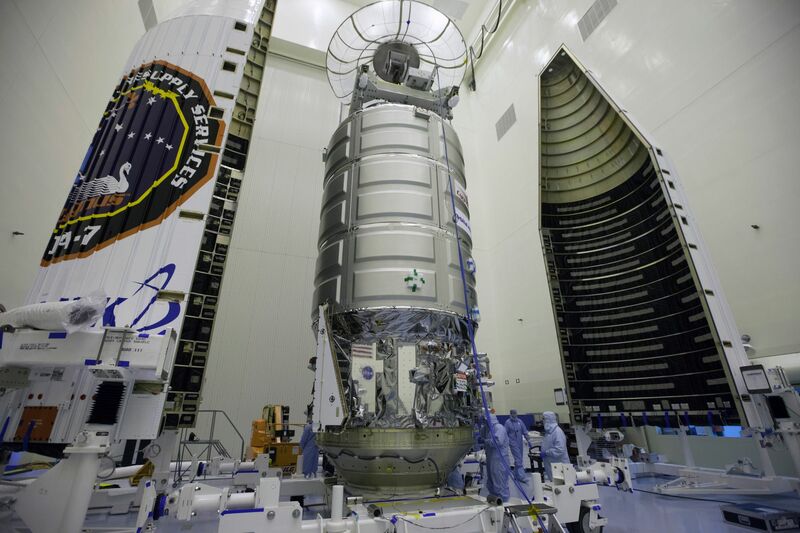 Cygnus OA-7 is carrying more science and utilization cargo to the Space Station than any U.S. Commercial Resupply Services vehicle to date, supporting a busy summer of science operations with 216 studies planned across the U.S. Segment during Expeditions 51 and 52, covering virtually all branches of science. Packed into the Cygnus cargo craft is a total pressurized cargo of 3,376 Kilograms divided in 940kg of science investigations, 954kg of crew supplies, 1,215kg of systems hardware and 93kg of spacewalk equipment, computer resources and Russian hardware. 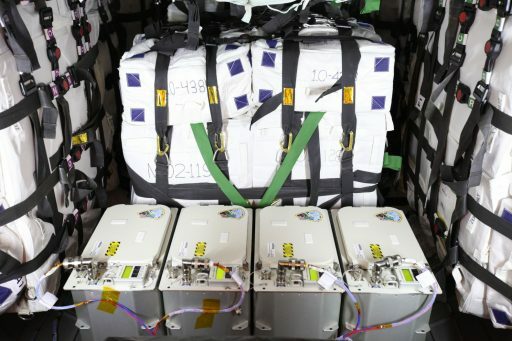 Items stashed away in the Italian-built pressurized cargo compartment range from supplies such as food for the crew and sanitary items to complex systems hardware like NASA’s Advanced Plant Habitat and a new low-cost device enabling heat shield materials to be tested in the actual environment of re-entry. Known as APH, the facility will take up residence in the Kibo laboratory and complete several studies involving different plants to figure out the best combination of external factors such as light, water, nutrient supply and air constitution that yield the best possible plant growth & yield. 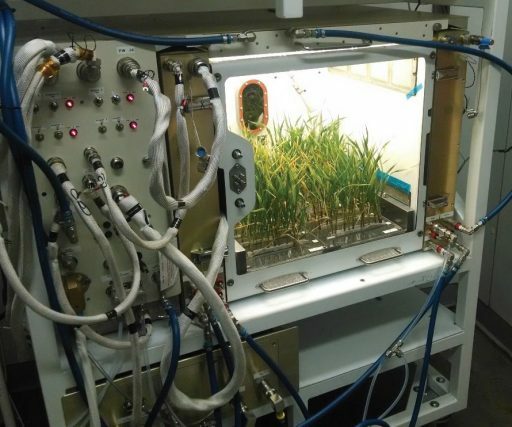 Cygnus is ferrying four powered laboratory freezers to the Space Station holding various cold stowage items including a series of microbiological studies aiming to demonstrate a set of tools needed to establish a genetic research facility aboard the Space Station. One experiment employs magnetic nanoparticles that attach to cells in order to make handling of cell cultures possible in the microgravity environment while another pair of studies tests whether techniques for DNA replication and in-space sequencing are feasible for the identification of microbes growing on a spacecraft. 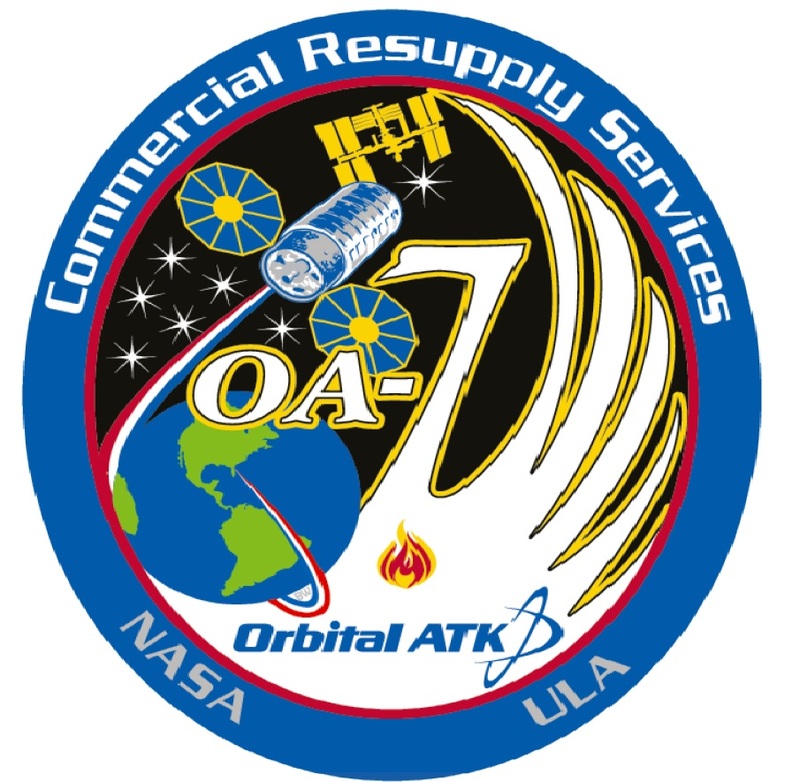 The OA-7 mission is also ferrying cancer research, gear for cardiovascular research involving the Station’s crew members, and studies looking at bone loss in space. A total of 38 CubeSats are aboard the Cygnus spacecraft – 34 of which will deploy from the Space Station while the remaining four are aiming for a slightly higher orbit and will be released from Cygnus after it departs ISS. The four satellites in the external deployer belong to Spire Global’s Lemur-2 constellation collecting atmospheric profiles for meteorology and global ship-tracking data offered on the commercial market. 28 of the satellites launching from ISS are part of the QB50 project – an international initiative coordinated by the Von Karman Institute to deploy a loose constellation of CubeSats to collect measurements of Earth’s lower thermosphere – a region spanning from 90 to 380 Kilometers in altitude where previous missions were only able to make sporadic measurements. 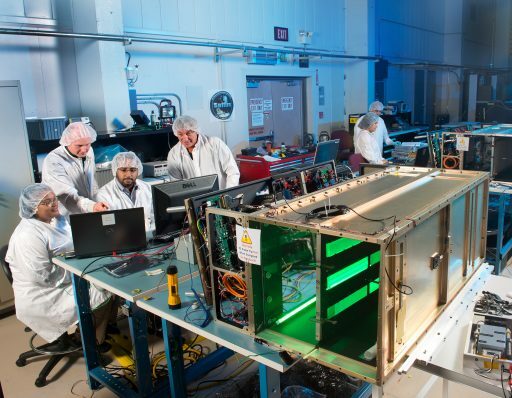 The satellites flying on Cygnus are from 17 different countries and are scheduled for deployment in May followed by the launch of an Indian PSLV rocket that will lift another batch of QB50 satellites – enabling multi-point measurements around the globe to help understand energetic processes ongoing in Earth’s upper atmosphere. The remaining satellites on board are the commercial ALTAIR-1 tech demonstrator, NASA’s IceCube that demonstrates a radiometer for ice cloud measurements, CSUNSat-1 that will test an innovative power storage system capable of operating in low temperatures, CXBN-2 that aims to measure the diffuse X-ray background of the early universe, Biarri-Point – a pathfinder for a defence-related satellite project involving the U.S., UK and Australia, and an as of yet unnamed NASA sponsored satellite. Two payloads carried by Cygnus will only come into play once the spacecraft has ended its three-month stay at ISS – the third SAFFIRE combustion study and the RED-Data2 re-entry experiment. SAFFIRE will ignite a large piece of fabric to study how fires spread on a spacecraft, following up on a pair of experiments performed on the last two Cygnus missions that also looked at large-scale flame spread and evaluated the flammability of different material to inform the designers of future spacecraft. RED-Data2 is about the size of a soccer ball and will gather data on how the Cygnus spacecraft breaks apart when entering the atmosphere to help improve models of large-object re-entry. The device also tests a pair of heat shield materials that will be put to the test once RED-Data2 is separated from Cygnus and experiences the actual re-entry environment which is hard to simulate in ground-based experiment rigs. This data will help qualify new variations of existing heat shield technologies for use on NASA’s Orion spacecraft and planetary probes. The S.S. John Glenn marks the fourth flight of the enhanced Cygnus spacecraft, sporting an extended cargo carrier to lift more payloads to the Space Station. 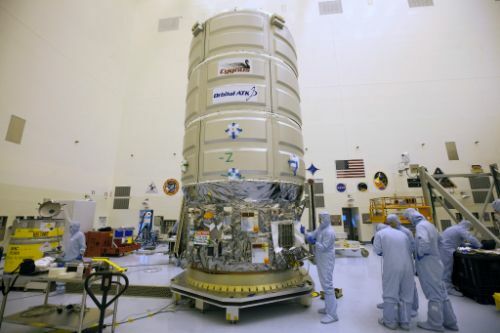 Overall, Cygnus stands 6.4 meters tall and is 3.2 meters in diameter, comprised of a Service Module derived from Orbital ATK’s flight-proven satellite platforms and a pressurized cargo carrier manufactured by Thales Alenia in Europe, based on the Multipurpose Logistics Modules that used to fly up on the Space Shuttle. 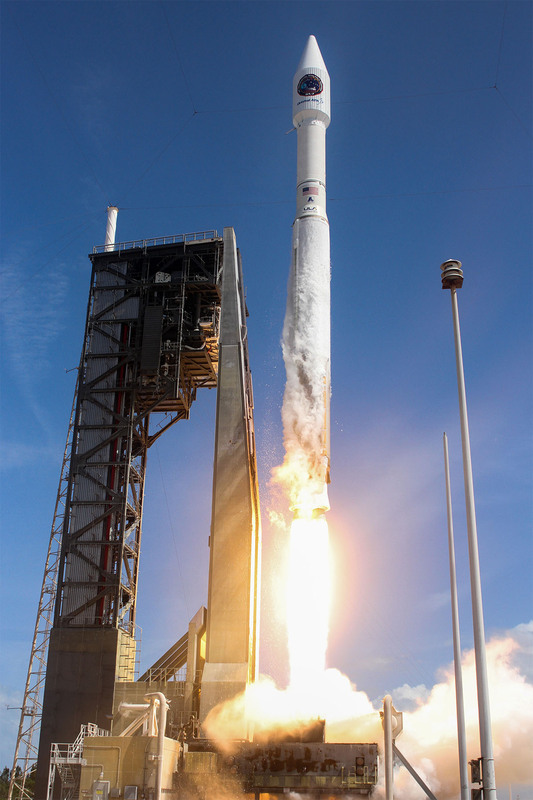 Cygnus OA-7 was shifted from a planned launch on Orbital’s Antares to become the third Cygnus to fly on an Atlas V, taking advantage of the rocket’s schedule certainty and greater power to deliver the maximum amount of supplies to ISS, supporting dozens of scientific studies and keeping ISS stocked on consumables and spare parts. 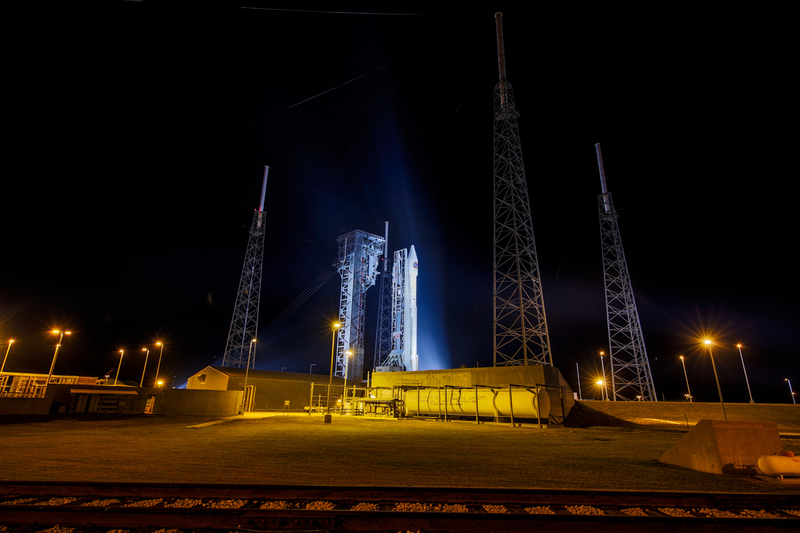 Heading into Tuesday’s countdown, teams were looking at a favorable weather forecast and a well-performing vehicle, having overcome a month-long launch delay due to a hydraulic issue on the first stage of the rocket. Countdown operations picked up seven hours prior to the opening of the day’s half-hour launch window with the activation of the Atlas V rocket for a series of flight control system, communication and flight termination system checks to award the rocket a clean bill of health prior to tanking. Teams departed Space Launch Complex 41 before the countdown hit a planned pause at T-2 hours for the final setup tasks ahead of the cryogenic tanking sequence. As soon as clocks began ticking down again, Atlas V headed into its highly choreographed propellant loading sequence, starting with a chilldown on the Liquid Oxygen side to avoid a shock to the propellant lines and tanks when coming into contact with the -183°C oxidizer. The Centaur upper stage was first to enter cryo load, receiving 15,700 liters of the supercold oxidizer before the larger Common Core Booster also headed into LOX load to receive 185,000 liters. Only cryogenics had to be loaded during the countdown as the first stage had received its dose of 94,600 liters of Rocket Propellant 1 Monday afternoon. The final tank to be loaded was the Liquid Hydrogen tank on the Centaur, receiving 48,100 liters of the -253°C fuel before entering topping mode for the remainder of the countdown. While tanking was underway, a series of small issues cropped up and had to be dealt with by the Anomaly Team, reviewing a suspect sensor signature from the 1st stage LOX tank, a potential leak in a LOX chilldown line and a potential fault within the electrical system of the explosive Flight Termination System – issues that were cleared without delaying the launch. The Launch Team provided a unanimous GO to press into the automated countdown sequence for liftoff at the opening second of the day’s window, looking at a well-behaved vehicle, pristine weather conditions and a clear range. Resuming the countdown at the T-4 minute mark, Atlas V headed into a fast-paced series of steps to pressurize its tanks, switch to battery power and assume control of the countdown – all under the watchful eye of nearly 30 launch control stations. The familiar words ‘Go Atlas! 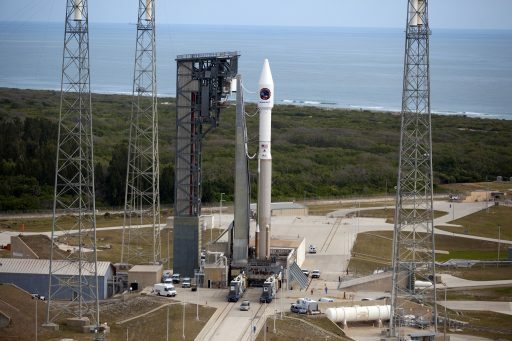 Go Centaur!’ marked the final status check before Atlas V came to life. AV-070 ignited its Russian-built RD-180 main engine at T-2.7 seconds, allowing for a brief period of thrust build-up and monitoring before Atlas V was committed to flight by releasing the hold-down system. The 59-meter tall rocket began rising from its launch pad at 15:11:26 UTC with a thrust of 390 metric ton force, balancing in a perfectly vertical posture for the first 18 seconds of the flight before initiating its pitch and roll program. 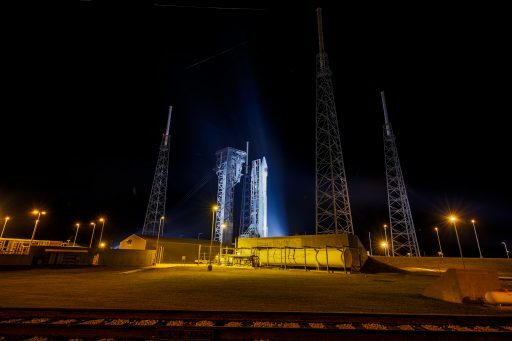 Burning 1,150 Kilograms of Kerosene and Liquid Oxygen per second, the two-chamber RD-180 gimbaled to put Atlas V on its planned 44.4-degree flight azimuth, departing to the north-east on a coast-hugging trajectory before crossing the Atlantic Ocean. At the moment of liftoff, the Space Station was 400 Kilometers above the English Channel. Atlas V pushed through the sound barrier one minute and 23 seconds into the flight and passed the area of Maximum Dynamic Pressure eleven seconds later. While the first stage was still firing at full throttle, Centaur prepared for its role in the mission by pressurizing its reaction control system and chilling down its main engine. Thrust on the RD-180 engine was gradually reduced in the last seconds of its burn to limit acceleration on the vehicle to 5Gs. BECO – Booster Engine Cutoff was called four minutes and 15 seconds into the flight after a nominal performance by the first stage, burning 284 metric tons of propellants over the course of its burn. Six seconds after cutoff, separation charges were fired and the 32.5-meter long first stage pulled away from Centaur with solid-fueled retrorockets. As the first stage dropped away, Centaur immediately purged its attitude control thrusters and initiated the pre-start sequence on the RL-10C engine prior to firing up at T+4 minutes and 31 seconds, soaring to 11,200 Kilogram-force of thrust to push Cygnus into orbit. 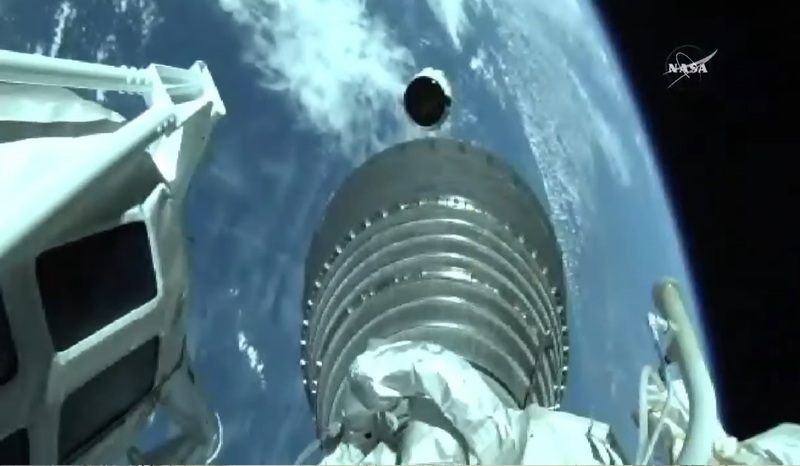 Seven seconds after Centaur ignition, the two 14-meter long fairing halves split open and fell away – revealing the Cygnus spacecraft for the rest of its ride after departing the dense layers of the atmosphere where aerodynamic forces could hurt the delicate spacecraft structure. Over the initial portion of Centaur’s planned 13-minute and 42-second burn, the upper stage held a slightly pitched-up attitude to reach the desired altitude and then pitch down to accelerate to orbital velocity, injecting Cygnus into the target circular orbit with a single burn instead of a more complex two-burn profile. Centaur finished its burn 18 minutes and 13 seconds into the mission, beginning a brief re-orientation and stabilization period to set up for the release of the Cygnus spacecraft. The S.S. John Glenn was sent on its way at 21 minutes mission elapsed time, achieving an orbit of 227.4 by 230.0 Kilometers, 51.62° – right on target per the requirements for the mission. Drifting away from Centaur, Cygnus immediately began stabilizing its orientation and establishing contact with Mission Control in Dulles, Virginia through NASA’s Tracking and Data Relay Satellite System. A series of checks will be run to ensure Cygnus is in good shape before commands will be sent around 100 minutes into the mission to unfurl the two circular Ultra-Flex solar arrays, clearing the way for a series of elaborate orbit-raising maneuvers to position Cygnus for Saturday’s rendezvous. For the Centaur Upper Stage, the mission was to continue toward a 10.7-second retrograde deorbit burn 48 minutes and 30 seconds into the flight to enter a sub-orbital arc toward a fiery demise. Impact of any surviving components of the Centaur was planned 67 minutes after launch south of Tasmania. 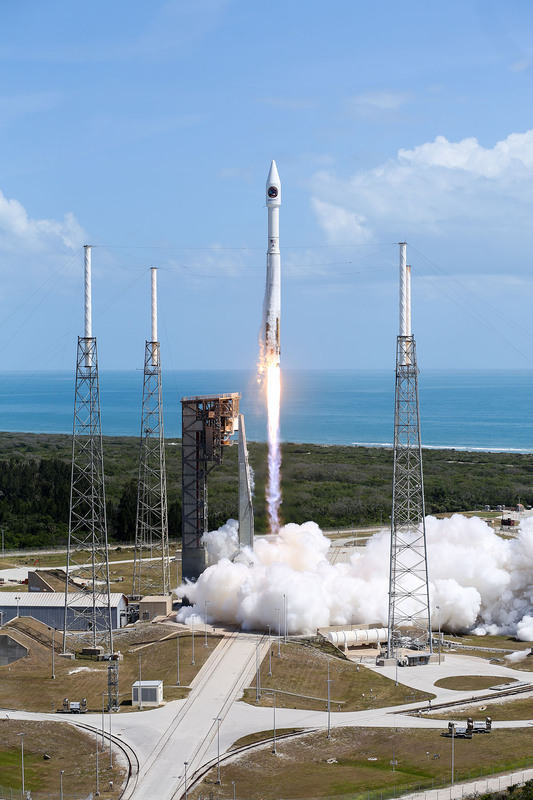 Tuesday’s launch marked the 71st Atlas V launch, the 36th to fly in the basic 401 configuration and the third mission of the workhorse in 2017. 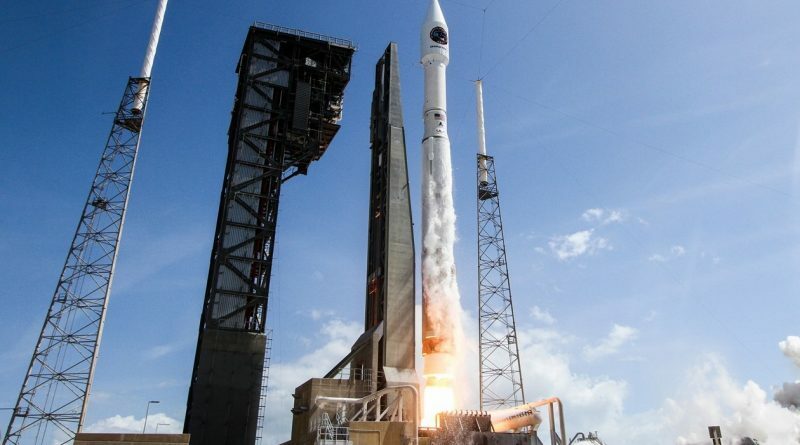 It was the 653rd flight of a vehicle named Atlas in a program dating back to the early days of U.S. space flight. 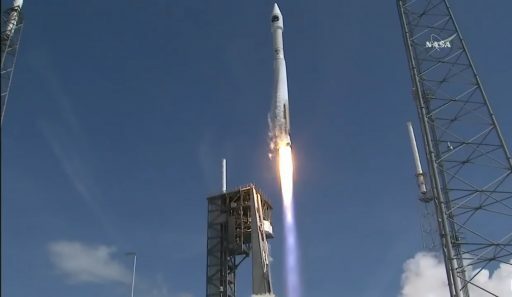 For United Launch Alliance, a slight lull in launch activity lies ahead with the next scheduled launch set for August 3 using an Atlas V rocket to lift a Tracking and Data Relay Satellite to orbit for NASA followed less than two weeks later by a clandestine satellite delivery for the NRO from Vandenberg Air Force Base, also using Atlas V.